Audrey Thomas is a writer, contemporary to Mavis Gallant and Alice Munro, who has written as many volumes of short stories as she has novels. Many of us who came of age around 1970 read Canadian Literature and knew the work of Audrey Thomas well. One of the reasons I read, and still read, the work of Audrey Thomas is because she has often set her stories and novels in Ghana. I lived in Ghana, on the coast near Accra, for only a few years in the early 1960s when I was a child but it is a place that has stayed with me. During the years I lived there it seemed idyllic, in spite of the poverty and the lepers on the side of the roads, for a child it was a place of beauty and freedom. The beaches were exquisite and with school only in the mornings we were free to run like wild things all afternoon. The heat may have bothered the adults but we children seemed immune. Audrey Thomas lived in Ghana from 1964 -1966 when her husband worked in Kumasi, in central Ghana. Kumasi was home to a university where many Canadians taught. We sometimes went there on weekends so that my parents could visit other Canadians – the children, ignored, playing days long Monopoly games. Another esteemed Canadian writer, Margaret Laurence, also lived in Ghana from 1952-1957, in Accra. Both Margaret Laurence and Audrey Thomas were deeply affected by their time in Ghana and wrote about the place in their fiction all of their lives. 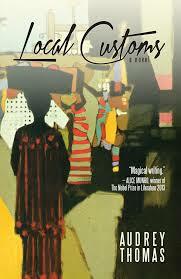 Local Customs by Audrey Thomas was released this spring – almost 50 years since she lived there. This novel is set even further in the past, in 1838, on the Gold Coast, and chronicles the story of Letitia Landon. Letitia was a British writer, a poet of some repute, who married the British Governor of the Gold Coast. Shortly after their arrival at Cape Coast Castle Letitia died – a death that may or may not have been suspicious. I am not giving anything away by telling you of her death, because it is Letitia herself who tells the story. Local Customs is a fascinating novel, much of it set at the Cape Coast Castle, once used for the slave trade it still stands, now a museum. We also have an insight into some of the customs and beliefs of the Ashanti people, still very much in evidence in the 1950s, 60s and 70s, with a very strong belief in witchcraft potions for both poisoning and cures were widely used. When my mother became very ill in Ghana no cause could be found and many, including some of the medical staff, were convinced her illness was the result of witchcraft. We left Ghana as soon as she could travel – no diagnosis was ever made and she recovered completely. I am sure she had some sort of tropical disease – or an ulcer from the incredible amount of drinking that went on among the expats – as Audrey Thomas writes it is “a most insalubrious climate”. Needless to say my mother has nothing good to say about Ghana. Perhaps my memories of Ghana are so clear because it was a place so extremely different - from say, Sussex, New Brunswick. The insects were larger and there were so many of them – everywhere. There were lizards and snakes – everywhere. There was also bougainvillea and flame trees and calla lilies extravagant in size and colour. There were paw-paw trees just outside our back door – with a taste you never forget and will never find in an imported papaya. The soil is red laterite, with anthills taller than most men, the ants huge. We always shook out our shoes in case of scorpions. Anyone who writes about Africa writes about the smell of the place “rich, moist, sweet, excessive, the smell of West Africa”. Those are the words of Audrey Thomas from a short story I read many years ago. I never forgot the pivotal scene – a scene that I have searched for year after year, picking up early short story collections by Margaret Laurence and Audrey Thomas and re-reading, searching without success. I was beginning to wonder as the years passed if I’d imagined it – but was sure I had not. Then, looking for information about Audrey Thomas to do this review, Eureka! I came across a website Canadian Writers Abroad and a review by Debra Martens that mentioned The Wild Blue Yonder a short story collection by Audrey Thomas and the story Slow of Despond with enough description for me to know this must be the story – not exactly as I remembered it but close enough. Unfortunately most of the story collections and novels by Audrey Thomas are out of print, such is the state of Canadian publishing in the 21st century. Fortunately we have small publishing houses such as Dundurn still committed to publishing fine work by Canadian authors, and bringing us Local Customs, a very fine novel by Audrey Thomas.